Last week, the Finance and Administrative Services and Human Services Departments sent a memo to the Council delivering that feasibility study. They will present their findings in person this Thursday morning to Council member Mosqueda’s Housing, Health, Energy, and Workers Rights Committee. They believe that the facility will require 2000 square feet of space for 10 consumption spaces, offices for 14 staff, needle exchange space, reception, waiting rooms, restrooms, storage, and utility space. Acquiring a portable “medical vehicle” which would serve the community parked on the street or in a parking lot, while housing the other space needs in nearby leased space. The startup timeframes vary widely, from as short as six months for options 1,3 and 6 to as long as 3 years for option 2. Part of the costs is for community outreach, both for the initial site selection as well as $300,000 per year for “neighborhood mitigation and continued outreach.” That includes “emphasis patrols” and garbage sweeps. The report explains that the City of Seattle and Public Health of Seattle-King County (PHSKC) will share responsibility for site selection. PHSKC will provide data on where heroin deaths have occurred, as well as expertise on operating medical facilities. The city will provide information on neighborhoods and areas that “meet the criteria for siting,” and ensure that public safety departments are part of the decision-making process. The report also says that PHSKC will be responsible for operating the safe consumption site, either entirely on its own or by contracting out some services to partner organizations. It doesn’t specify, however, how the city and PHSKC will share the costs. According to the budget proviso, the report is also supposed to include a viable site, so the city’s work is not yet done. That task will be the most difficult part, and if the city is smart it will include community outreach into the siting process so it doesn’t run into the same issues as with the siting of the Navigation Center. 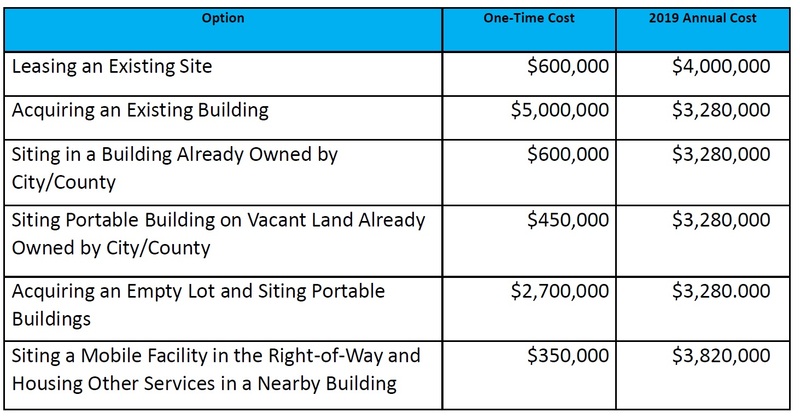 There’s a lovely little catch-22 here: the outreach related to siting will require FAS and Human Services to tap into the $1.3 million the Council reserved, but the proviso says that the money can’t be touched until a viable site is identified. It’s easily solved, though: the Council just needs to amend its proviso — if it’s happy with the cost estimates. That said, if the outreach and site selection is successful and proceeds apace, the $1.3 million isn’t nearly enough to cover startup and first-year operational costs for a safe consumption site under any of the six options, so either the Council will need to find more money, or PHSKC will need to bring some money to the table later this year. I believe in science and the findings that these safe injection sites save lives. 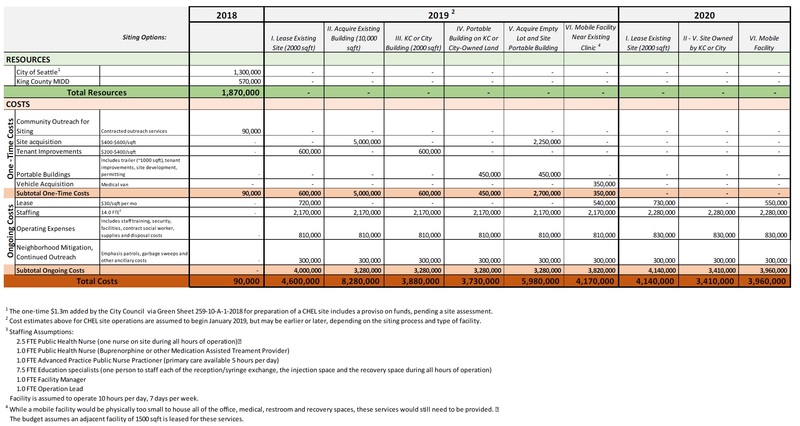 However, this proposal seems way overblown with space for 10 injection rooms and staff of 14 (at fully burdened rate of $155K per employee per year). 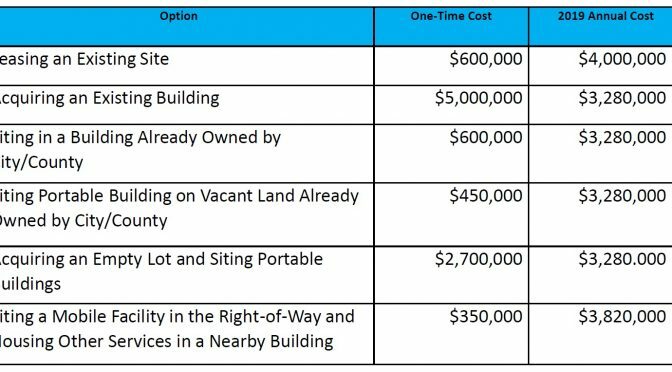 Boston managed with 10 chairs in a single room and NYC started with $100K feasibility study versus this $4-$8M proposal. If we could right size this proposal we might be onto to something and these funds (assuming they exist in the general fund) could be used to house and support hundreds (literally) of the most vulnerable in our community. Hi, Angus, your comment, “these funds (assuming they exist in the general fund) could be used to house and support hundreds (literally) of the most vulnerable in our community.” These funds don’t exist in the general fund. The head tax advocates have entertained the idea of setting money aside for drug consumption sites. This is money that is supposed to be designated to housing hundreds of the most vulnerable. Yet here we are. I’m on the opposite side of the issue (opposed to drug consumption sites) but I have to say I’m concerned the cost of drug consumption sites will create a giant sucking sound to everything around them. I would rather that resources be devoted to drug treatment access and to housing. To be clear: there is $1.3M of one-time funding in the 2018 budget for a safe consumption site. There is nothing set aside for future years, other than a hope that a new head tax can fund it on an ongoing basis.